If you're looking for cheap car rentals at Fort Myers Airport you need look no further. 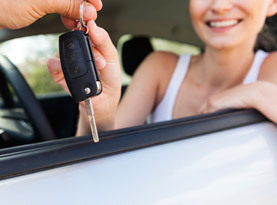 Prices of a large number of car hire companies can be compared at the touch of a button. Just select your dates and times for pickup and dropoff at Fort Myers Airport and type in your car preferences and the age of the main driver then hit the button for quotes and easy online booking. Fort Myers Airport connects to the city easily and an excellent road network makes getting around in a hire car a pleasurable experience. Fort Myers Airport is served by numerous car hire companies but it is a good idea to book your hire car in advance to avoid the stresses of trying to find a good bargain on arrival and to ensure that your preferred car type is waiting for you upon arrival. After picking up your cheap hire car at Fort Myers Airport, you can drive into the city and enjoy all of its downtown attractions or you can head to one of the beautiful beaches that Fort Myers and Sanibel are famed for. A hire car is also the best way to reach the parking bays where you can leave your car to explore the natural Sanibel and Captiva islands, and with your hire car in Fort Myers you are free to enjoy coasting alongside the Caloosahatchee River and all it has to offer. With temperatures peaking in the summer months between June and August, Fort Myers experiences pleasant, balmy weather throughout the rest of the year. Perhaps best enjoyed out of the hot season, Fort Myers' beaches are inviting even in the winter months.